With the Nimatic Auto Refracometer you can easily and quickly check the freezing point in your antifreeze, windscreen wash and battery fluid. With the Auto Refractometer from Nimatic you can measure propylene, glycol and ethylene asweel as you can use it for checking electrolytic batteries. 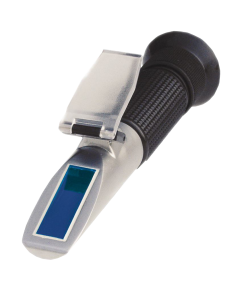 The Nimatic Auto Refractometer is securely packed with manual, pipette and screwdriver for calibration.